Ride the Fault Line: Four states in six days, including Missouri, Arkansas, Kentucky, and Illinois. 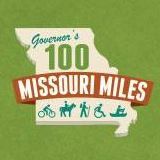 Experience this unique Midwestern bicycle tour adventure through four mid-Mississippi valley states along the New Madrid earthquake fault line. Visit Missouri, Illinois, Kentucky, and Tennessee in six days. Ride the Fault is more than a bicycle tour--more than just cycling! Nature lovers-have lunch at lakeside restaurants at Reelfoot Lake Wildlife Refuge and scan the trees for nesting bald eagles! Paddle a kayak through groves of century old cypress trees! History buffs-learn about the past-visiting strategically important early Civil War sites; and look to the future with a stop at the new Discovery Park science center in Tennessee! Cross the Mississippi River on an authentic riverboat ferry. Beat the heat with a trip to an outdoor water park! Enjoy camping outdoors, indoors, or select a motel from our list! New week! Early June promises cooler weather. New overnight community-say hello to Cape Girardeau, Missouri!